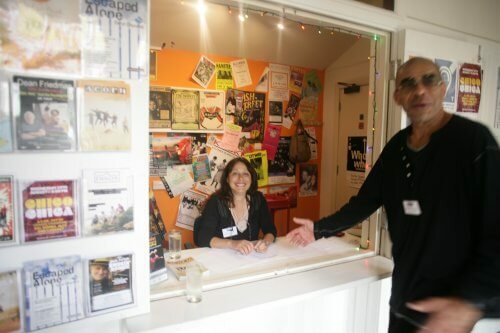 The Acorn is a charitable trust managed by a volunteer board of trustees, and almost all the people who work here give their time to help keep our venue open. In order to run every event, we require one House Manager to come along before the performance to open up the theatre and generally ensure the smooth running of the performance for volunteers, performers and audience members. Responsibilities also include working with the volunteers to ensure the safety of our audience in the building and just to be prepared for any issues that may arise during the show. Full training is given of course. No previous management experience required just a confidence to deal with members of the public, performers and an awareness of fire and health and safety measures. The majority of our volunteers help out on the night of performances, as Front of House staff. It takes 3 – 5 volunteers to staff each show, and with an average of 8 – 12 shows per month so we need a lot of volunteers to keep going! Front of house staff are crucial members of the team providing a welcoming face to our audience, tearing tickets, helping people to find seats and generally making sure the building is safe and well-organised during performances. You would need to be here an hour and a quarter before the performance starts and be able to stay until the audience has left. The only qualifications you need are a friendly smile. We need someone to run the box office for each show night. Some basic computer skills are needed, plus comfort with some small cash handling but full training will be given. Box Office staff are usually needed from an hour and a quarter before the performance starts until the end of the interval. We also open our box office during the daytime, for people who wish to pop in and book advance tickets in person. So if you have a few hours to spare on a regular basis, and like talking to people and telling them about the great shows we have on here, we’d love to hear from you. We are also on the look-out for volunteers who have time and skills to give in other capacities such as supporting our marketing team, office administration or simply distributing posters and leaflets around West Cornwall. As a small thank you for your support, every volunteer is entitled to a free complimentary ticket for every performance you help with.